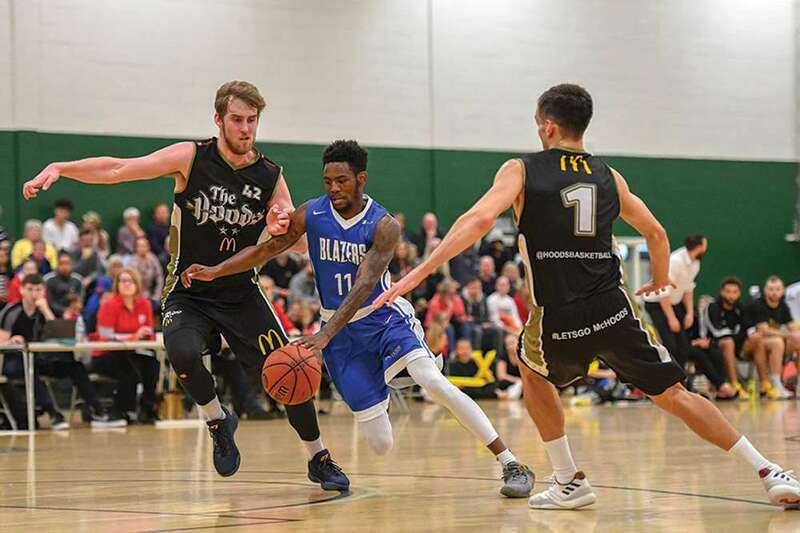 In some ways, Sunday’s trip to Nottingham was a harder match than they had experienced the previous night, when Derby beat the league leaders, Team Solent Kestrels. That’s because this game bore all the hallmarks of a true local derby; it was scrappy, disjointed and at times ugly to watch, but the true sign of a good side is whether or not they can grind out a result from a dog fight and the Trailblazers proved they could. It was no surprise to see a fired up David TinTin Watts leading Nottingham’s efforts. The former Derby forward was the Hoods top scorer with twenty points, with Cole Well being the only other Hoods player to reach double figures, finishing on sixteen. The Blazers were led by Malcolm Smith, who worked tirelessly for his 23 points and eleven rebounds. Isa Brandon and Oli Stanley both finished with fourteen points, while Jake Wesselingh and Kayne King added nine each, with the latter also dishing off eleven assists. Derby got off to a solid start. Despite losing the jump ball, they were first to score, thanks to a breakaway steal and a dunk from Brandon to start the game in style. After a response from Well, the Blazers then held the home side scoreless for the next four and a half minutes, as they piled in eight points without reply, six of which came from Smith. It was Well who eventually broke the deadlock, before a pair of Wilford free-throws made it 12-4. That was the cue for Watts to check in and make his mark with a pair of back to back three-pointers. Smith made it 14-10 before both sides missed multiple attempts. In attempt to add to their score, Derby called a time-out with 16 seconds remaining, but Benson Arogbo’s shot rimmed out leaving the Blazers ahead by just four points. Derby started the second quarter well, with a basket from Stanley, a three-pointer from Brandon and another score from Smith, but the Hoods responded with a 6-0 burst of their own to make it 21-16. A Derby time-out was followed by a missed jam from Wilford and a 7-3 from Nottingham as they cut the gap to just a single point, at 26-25 with 2’21” of the first half remaining. Both sides then missed opportunities to score and in the end, it was only Stanley who troubled the scorers before the break, as the Blazers stretched their advantage to 28-25. It was in the third quarter where Derby finally started to show their superiority. A basket from Stanley, a pair of free-throws from Brandon and a shot from downtown by Brandon quickly opened up a ten point advantage and after a response from Well, a basket from King and two more free-throws from Brandon gave the Blazers their biggest lead so far, at 39-27. Consecutive scores from Andrej Slavic were matched by back to back baskets for Wilford, but shortly afterwards the Blazers were dealt a blow when Brandon was called for his fourth foul, just moments after picking up his third. Derby needed to focus and they did just that, with Wesselingh coming off the bench to knock down back to back three-pointers via a pair of Charlie Brown assists. When he attempted a third, he was fouled by TinTin Watts, but calmly converted all three shots from the line, to give the Trailblazers a 57-45 advantage going into the final quarter. A 10-6 start to the fourth effectively put the game out of reach, but Nottingham’s Merry Men were in no mood for surrender and called the first of three time-outs to try and refocus their efforts. The first had little effect, but the second prompted a three-pointer and a lay-up from Luke Mitchell, as Derby’s lead was quickly slashed to 73-63. “It was a scrappy game and I’m sure it wasn’t pretty to watch but it was pleasing to get the win. We knew we needed to try and match their physical play because they’re are a big and strong team and I though we did well in that respect. “We got a handful of steals which led to some fast break scores which was important as we weren’t at our smoothest offensively. “That’s seven wins in a row and having dealt with two sides we had yet to beat, we have the current league champions up next, so it will be a real challenge to keep that run going,” he said. Hoods: Watts 17, Cole 14, Mitchell 12, Slavik 9, Ballantine 6, Maher 3, Wright 2, James 0, Powel 0, Traianos 0, Williams 0, Nelson DNP. Derby: Smith 23, Stanley 14, Brandon 14, Wesselingh 9, Wilford 9, King 6, Ward-Hibbert 2, Arogbo 0, Bowman 0, Brown 0. Derby Trailblazers was formed in the summer of 2000 running teams for boys at cadet (under 16) and junior (under 18) levels and senior women in the National Basketball League. Since then the club has grown and now provides opportunities for girls, boys, women and men to play, coach and officiate in the exciting game of basketball.